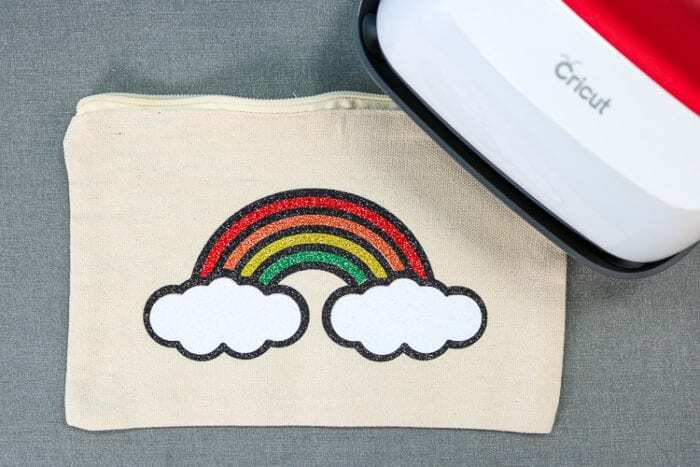 There are so many questions when you want to use two different types/colors of Iron on. Can I use different types of iron on? How to Layer Heat Transfer Vinyl? Which Layer goes first? Can I layer over glitter iron on? 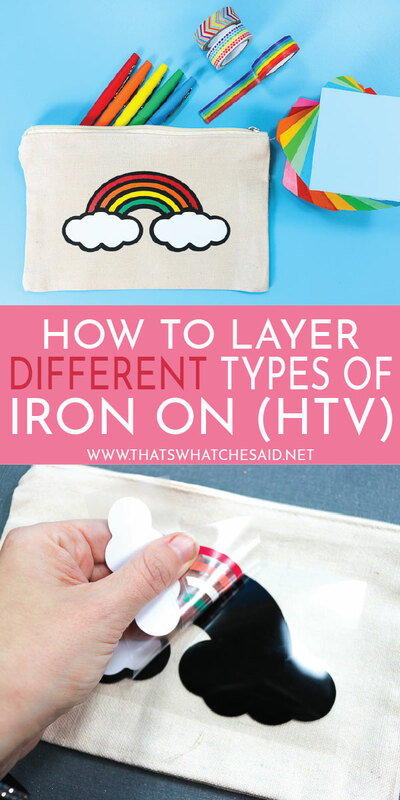 I am answering those questions and giving all my tips on layering iron on (HTV)! 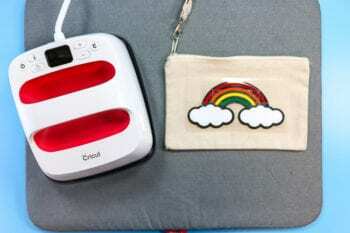 I use the EasyPress 2 to adhere all of my iron on vinyl to my selected surfaces. You can find out everything you need to know about the EasyPress 2 and why it is so awesome here. 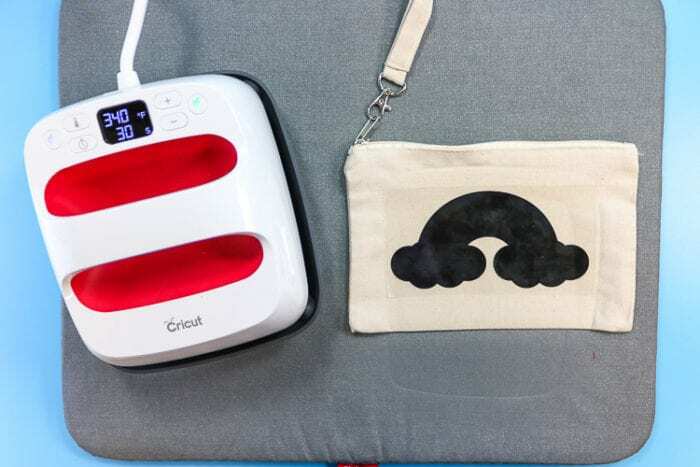 If you are new to Iron-on (IO) or also called Heat Transfer Vinyl (HTV) you are welcome to learn about the material here in my Iron-On Basics post. 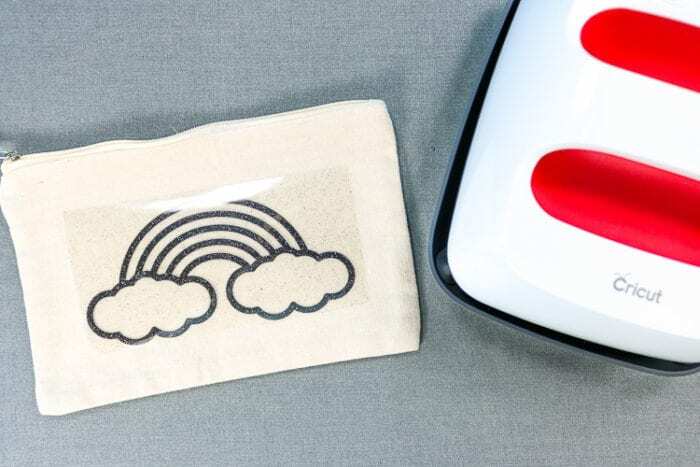 If you are just using one layer/type of Iron on, I have detailed instructions on how to prepare your blank, application, and aftercare in my How to correctly Apply Heat Transfer post. 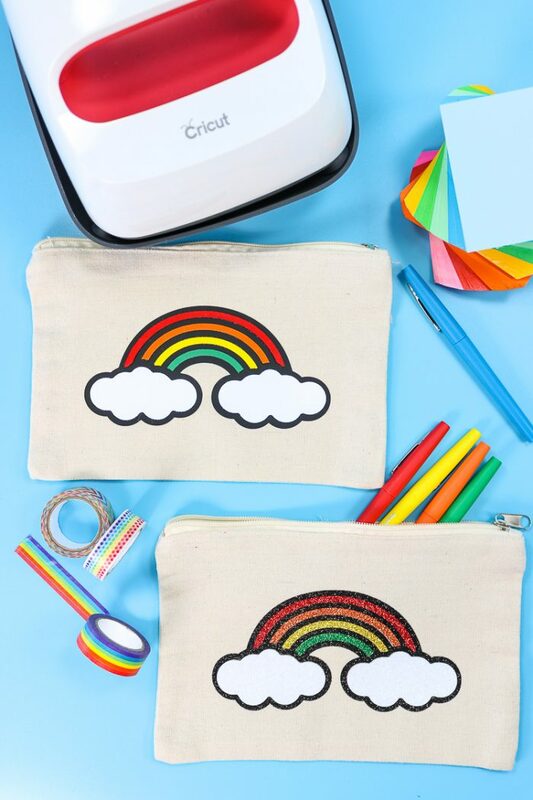 You can grab these files I used here in the Cricut Community! Can I layer Heat Transfer Vinyl (Iron on)? 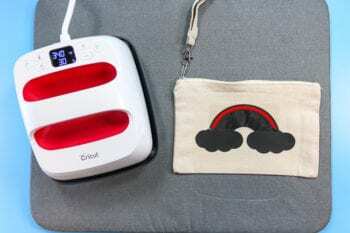 Everyday Iron on or Iron on Lite (regular iron on) CAN be layered up to four solid layers. Specialty Iron On should NOT be used as a base for Everyday Iron on. SportFlex can ONLY be layered with SportFlex and it is recommended to limit to 3 layers. Sportflex is that kid in the playground that is AMAZING at the monkey bars but doesn’t play nice with others! 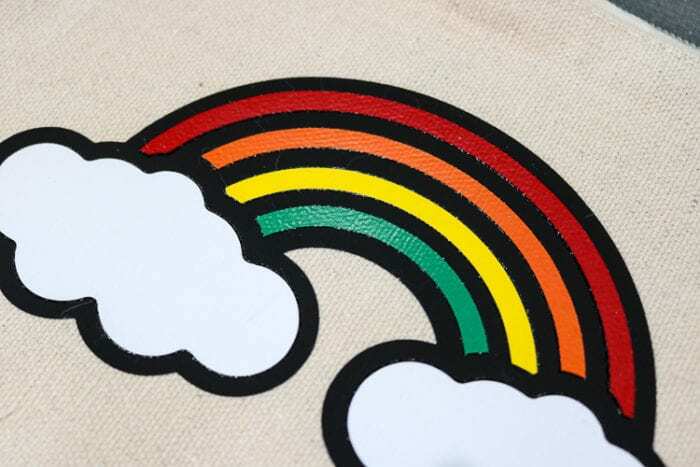 *read below on how to layer specialty iron-on. This is easy. You cut your designs on your Cricut Machine (Mirrored of course because we are using iron-on) and then weed the excess iron leaving only your design. Next, I stack my iron on layers as they should be assembled and place the stack where I want to apply on my blank. This is helpful if you have designs that are dependent on precise spacing and to make sure you have the entire design centered correctly! Remove the top layers (together). Press the bottom layer only, using the temperature from the recommended heat settings for the EasyPress 2. I only press for about 10 seconds on this base layer. It will not be completely set, but it will undergo the pressing from the rest of the colors so it does not need the full time right away. Peel off the carrier sheet as recommended also (cool or warm peel). Replace your colors 2,3,4 and 5 and line up with layer 1. Remove layer 3, 4 & 5 and press layer 2. Again only for 10 seconds. Same instructions as above. Repeat for all colors. Even though we have 6 different colors, we only actually have 2 layers! TIP: If you can, make the carrier sheet (liner) the same size for all your designs. This prevents the liner on upper layers from leaving an imprint on the lower layers when being pressed. Done! I told you that was easy! You know you got a good press when you can see the design of the fabric in your iron on. Make sure your base layer is cut from Everyday Iron on. Your top layer can be any specialty type. Apply your Everyday Iron on first using the Interactive Settings Guide. Use the full time recommended to press. Next, apply your specialty iron on according to the recommended settings. NOTE: If using more than one specialty iron on (not layered) press the material with the hottest temperature setting first. Can I layer glitter vinyl? Probably the most common question I get asked. The technical answer is no, but my answer to you is YES! I know what you are thinking. You are thinking “Cheryl, you JUST said above that specialty iron on CANNOT be layered upon” (see rule 2) and you are correct but we aren’t going to layer solid layers! We are going to use the SLICE Method to layer Specialty Vinyl. I mean sometimes you just need all the glitter vinyl, am I right? 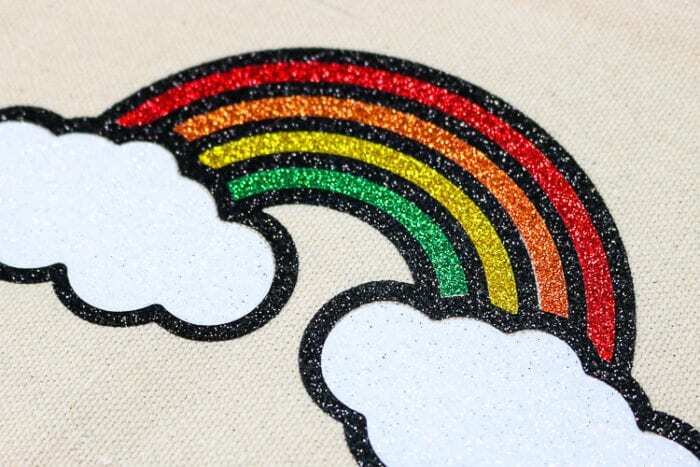 This method works for all specialty heat transfer vinyl, not just glitter iron on. I use this method all the time and love it. It also makes linking up your layers so much easier! Note: Iron on will adhere best to fabric versus itself. So the Slice Method is great for getting that layered look but not actually layering! Here are my “layers” all cut from glitter iron on! 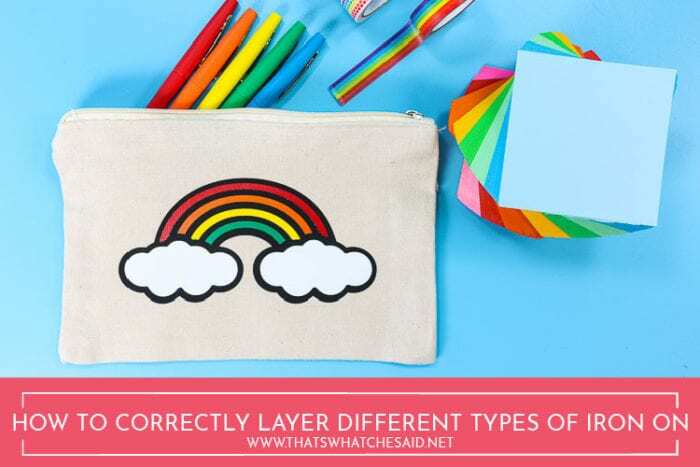 As you see, all the layers will make contact with the canvas pouch! I applied my black outline first. 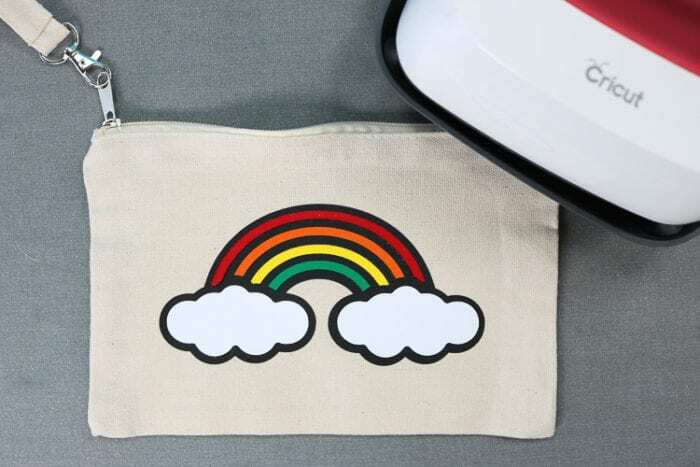 I cut the liner for each of the colors very close to the iron on and was able to apply all my rainbow colors in one pass. This will vary depending on the design you choose. Be careful to make sure the liner sheet is not under any of the iron on designs when pressing multiple colors at once! Then applied the last “layer” of the clouds! 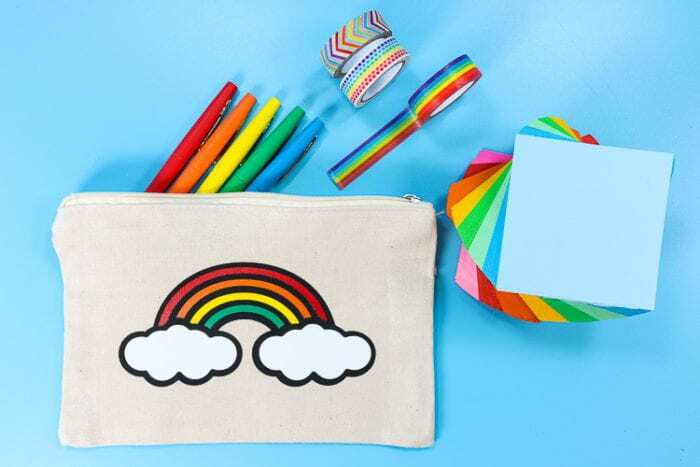 So here we have 6 colors but technically only one layer as each color is directly touching the canvas pouch! 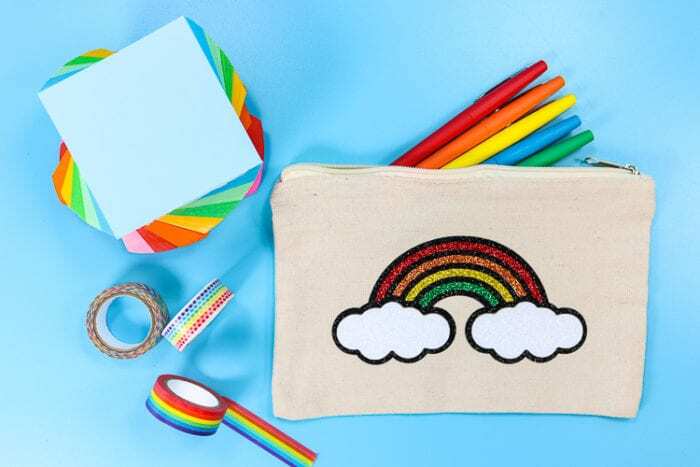 Everyone needs a glitter rainbow in their life, yes? What is the Protective Sheet For? 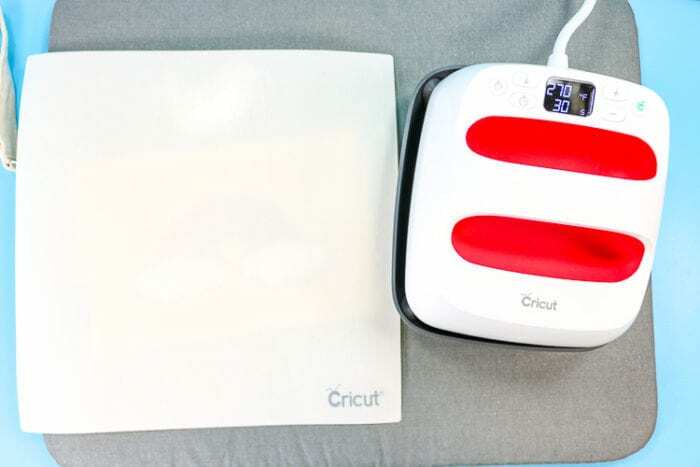 Cricut has a protective sheet that is can be used for a myriad of different purposes. Use when layering to protect previous pressed layers from the heat when the top layers are applied. 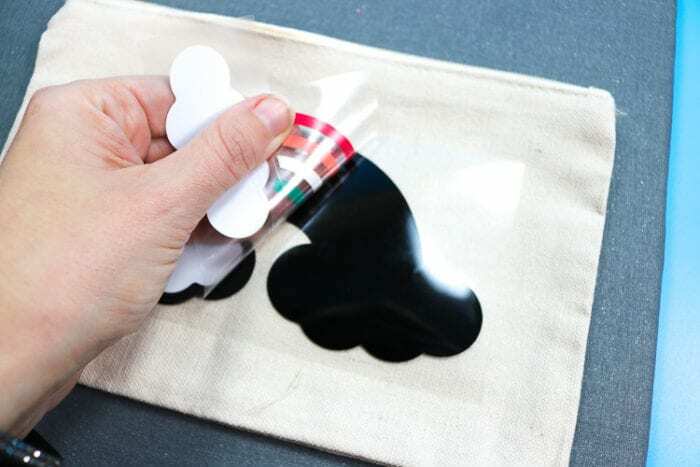 Use when applying specialty vinyl on blanks that require longer press times or to protect your the surface of the iron on itself. I particularly like to use the sheet with foil iron on or when I have several layers or several materials and press several times <–that was A LOT of the word several! Use when I applying iron on to non-fabric surfaces such as wood and metal. 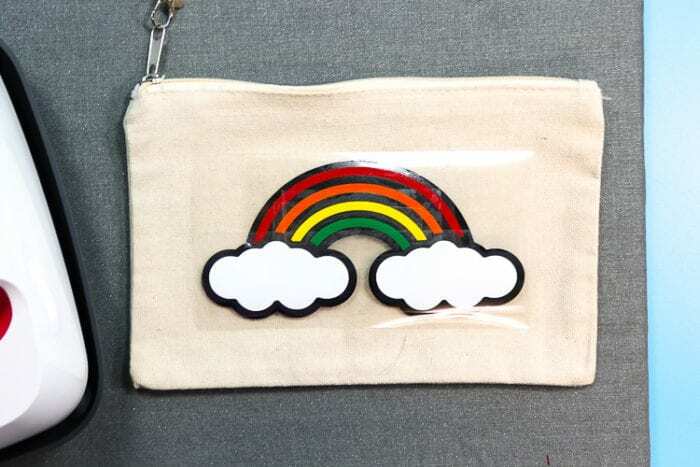 Here I simply pressed all of my layers of the rainbow pouch one last time before flipping over and applying heat from the reverse side. I protected all the layers from the direct heat plate of the EasyPress (since they had been pressed numorous times before) with the Protective sheet. 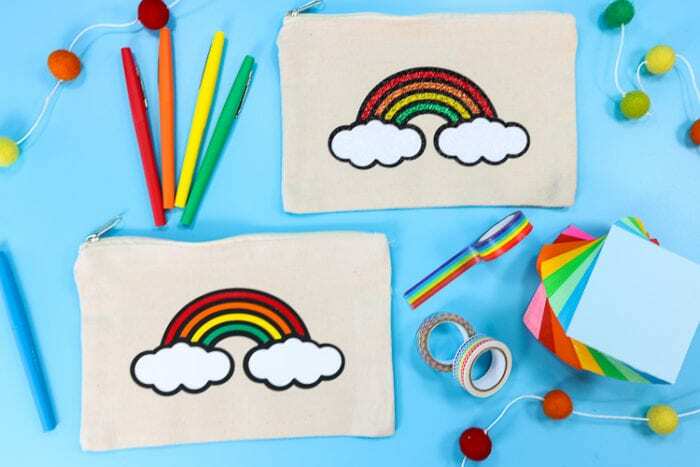 Let’s say you want to make a fun design with multiple types of iron on. The file in Design Space is already sliced for you. How do you correctly apply the different types? The answer is to look up the heat settings for each type of iron on you are using (with the type of base you are using). Apply the type that has the HOTTEST setting first. Then work cooler. When going with this type of application I press the hottest layer for the recommended time in the settings chart. Above I lessened the time. Here I will use the full time and then I will use the protective sheet for each layer after that. The reason is that if you do not get that first layer all the way adhered, chances are it will not fully apply. Since the additional layers are of cooler temperatures, that fact paired with the protective sheet will help protect that layer while applying the other layers. For my Thanksgiving Day Keepsake Runner, I Used both Everday Iron on and Foil Iron on. The layers did not overlap but I pressed the Everyday Iron on first because it had a hotter temperature setting and then the Foil Iron on after as it had a cooler temperature setting! Yes! You can layer SportFlex with ONLY SportFlex and it is recommended to keep it at 3 layers or less. You can find everything you need to know about SportFlex and application tips and tricks here. Can I layer Iron On Designs? No. 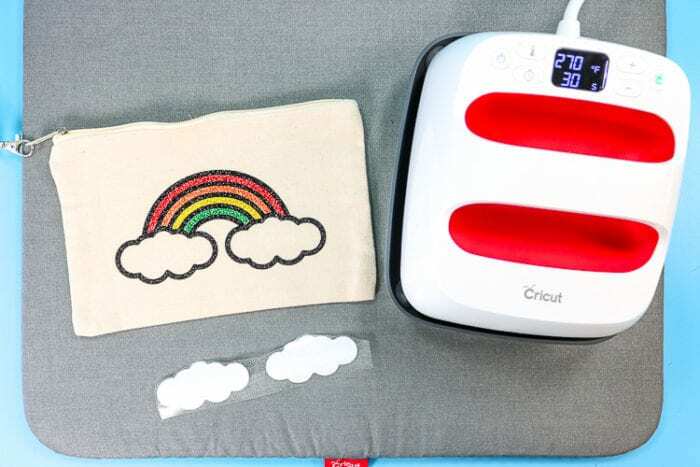 It is not recommended to layer Cricut Iron-on Designs, however, you can certainly personalize any Iron on Design with separate Iron on, just not in a layered way. My friend Cori personalizes the donut design so cute here. 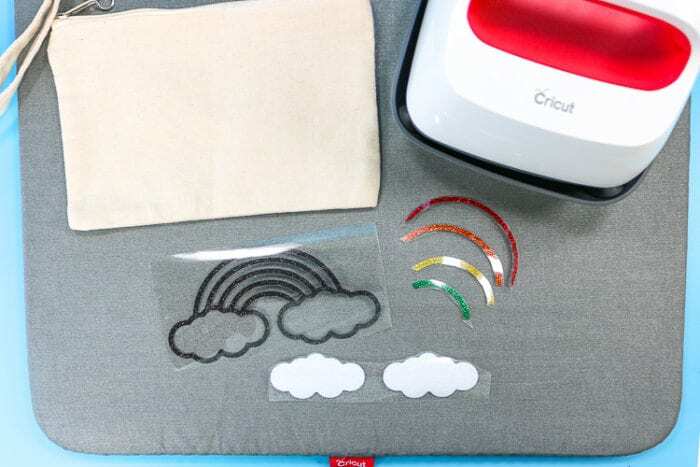 You can read all about Cricut Iron On Designs, see my favorites and how awesome they are to quickly make a fun project here. 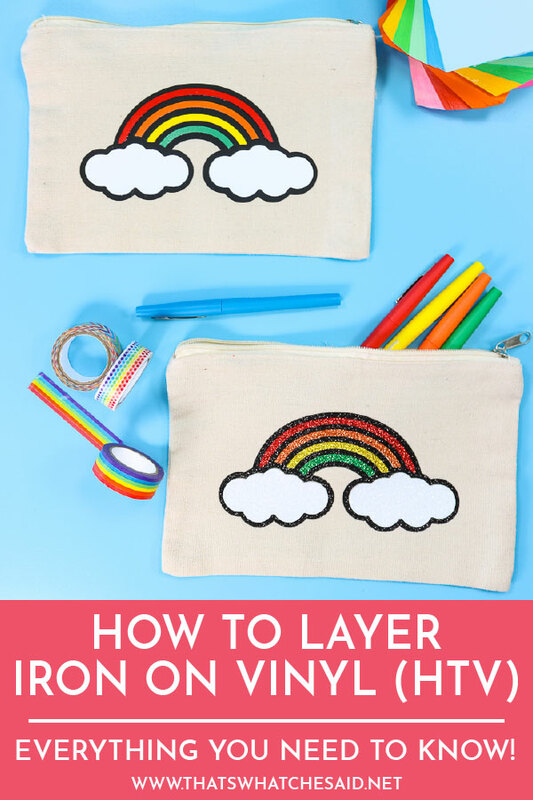 Now you should be ready to Correctly Layer Iron on Vinyl and press with your EasyPress 2. Wow! This is a lot of great info! Thanks for sharing it! Would it be possible for you to do videos on the types of vinyl and the correct way of applying it. I’m sure I’m not the only one who needs visual aids! Thanks! I will add it to the to-do list Cherie! Thanks so much! I’m sure you have a bazillion things on your to do list!